Five artists have been nominated for a £30,000 sculpture award its inaugural winner split with her fellow nominees. Helen Marten made headlines in 2016 after pledging to share the first Hepworth Prize for Sculpture with the other three shortlisted artists. Michael Dean, Mona Hatoum, Phillip Lai, Magali Reus and Cerith Wyn Evans are all in contention for the second iteration of the biennial award. The winning artist will be announced in November. 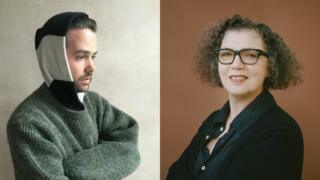 The shortlisted artists’ work will go on show at the Hepworth Wakefield gallery in West Yorkshire at the end of October. The prize is open to British or UK-based artists of any age who have made “a significant contribution to the development of contemporary sculpture”. Simon Wallis, director of the Hepworth Wakefield, said the nominees’ work presented “a broad spectrum of experiences and concerns”. Barbara Hepworth was born in Wakefield in 1903 and was a leading figure in the international art scene throughout her five-decade career. Magali Reus was born in Den Haag in the Netherlands in 1981, and first exhibited work in London in 2008. Michael Dean lives and works in London and was nominated for the Turner Prize in 2016. The Newcastle-born sculptor said he was “properly chuffed to have the chance to contribute” to the Hepworth Wakefield’s “amazing work”. Mona Hatoum was born into a Palestinian family in Lebanon in 1952 and has lived in London since 1975. Hatoum, who received the Whitechapel Gallery’s Art Icon Award in January, said she was “delighted to be nominated” and “very honoured” to have her name associated with Barbara Hepworth’s. Phillip Lai was born in Kuala Lumpur, Malaysia in 1969 and currently lives and works in London. He says he is “surprised and delighted to be asked to be involved in the second incarnation of The Hepworth Prize for Sculpture”. Cerith Wyn Evans is a Welsh native, born in Llanelli in 1958, who now lives and works in London. He says The Hepworth Prize is “refreshing in its acknowledgement that the vicissitudes of light and time are intrinsic to the appreciation of sculpture and plastic form”.